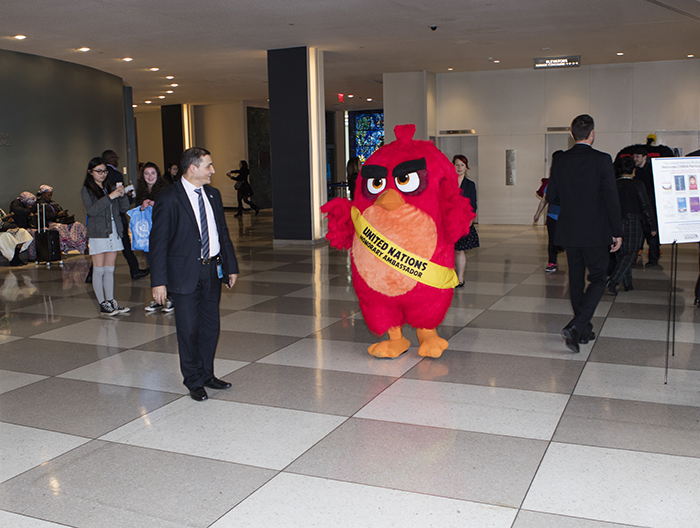 United Nations, New York, USA, March 18 2016 – Ambassador Red from Angry Birds during the United Nations Ceremony, Presentation and Photo Call naming him Honorary Ambassador for the International Day of Happiness today at the UN Headquarters in New York. United Nations, March 18 2016 – The United Nations today announced a campaign, launched in partnership with the Angry Birds – the globally renowned mobile game characters – to encourage young people to step up their actions to address climate change and ensure a sustainable and happier future for all. The campaign makes a direct link between tackling climate change and people’s happiness and well-being on the occasion of the International Day of Happiness. Secretary-General Ban Ki-moon appointed Red of the Angry Birds as an Honorary Ambassador for Green at a launch event at UN Headquarters in New York. As part of his ambassadorial duties, Red will go on a “virtual world tour” starting on 21 March, highlighting various ways to take climate action. His tour will take him to Paris, where countries adopted an historic agreement to address climate change in December, and will end in New York, where world leaders will sign the Paris Agreement at UN Headquarters on 22 April. 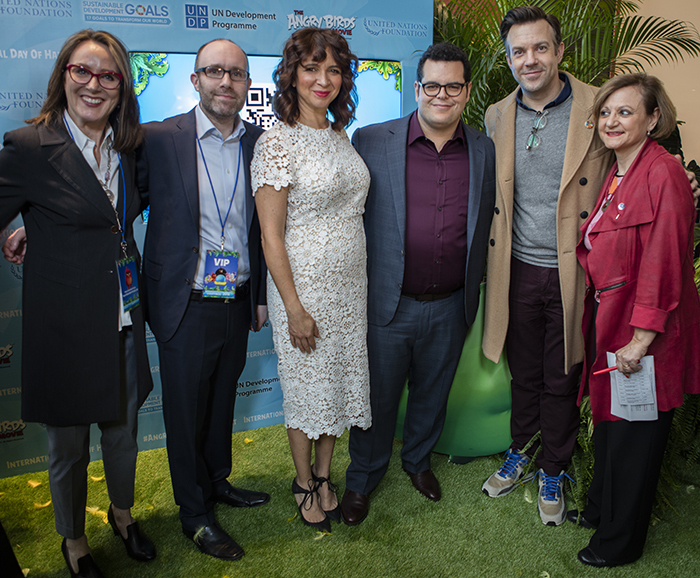 During the launch event, the voice actors from the upcoming Angry Bird movie, Jason Sudeikis, Josh Gad, and Maya Rudolph, and producers John Cohen and Catherine Winder gave hundreds of students gathered in the iconic UN General Assembly Hall a sneak preview of the #AngryBirdsHappyPlanet campaign materials. United Nations, New York, USA, March 18 2016 – Producer Catherine Winder, John Cohen, Maya Rudolph, Josh Gad, Jason Sudeikis and UNDPI Cristina Gallach during the United Nations Ceremony, Presentation and Photo Call naming Red, from the Angry Birds, Honorary Ambassador for the International Day of Happiness today at the UN Headquarters in New York. 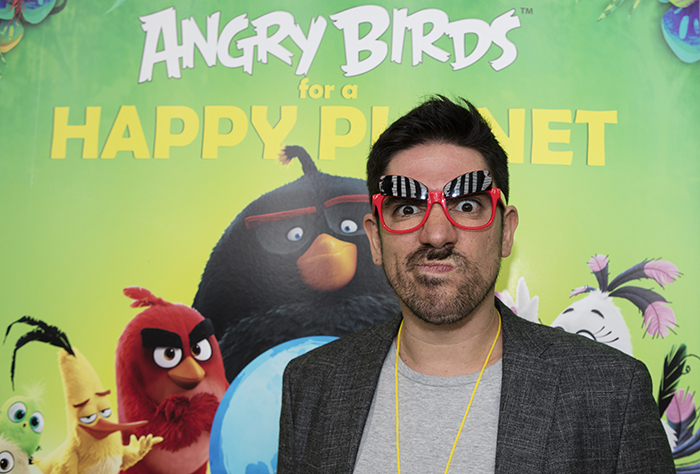 United Nations, New York, USA, March 18 2016 – Brazilian comedian and the voice of Red on his country Marcelo Adnet during the United Nations Ceremony, Presentation and Photo Call naming Red, from the Angry Birds, Honorary Ambassador for the International Day of Happiness today at the UN Headquarters in New York. The United Nations, in partnership with the mobile game characters Angry Birds, announced a campaign to encourage young people to address climate change and ensure a sustainable and happier future for all. The campaign was launched in commemoration of the International Day of Happiness, 20 March. The campaign, in partnership with Sony Pictures Entertainment, the UN Development Programme and UN Foundation, asks the general public across the world to make the Angry Birds happy by taking actions on climate change and sharing their photos and commitments on social media platforms using the common hashtag #AngryBirdsHappyPlanet.